Marketing Pilgrim shared some interesting insight and results form the latest Quarterly Digital Intelligence Briefing from Econsultancy and Adobe. 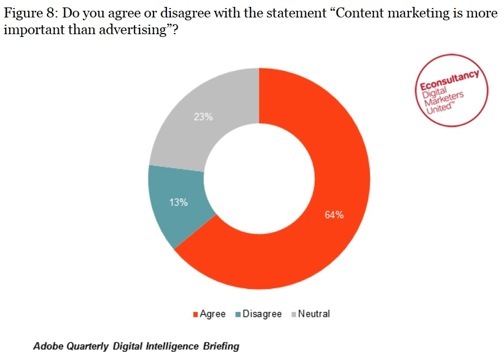 The results include some interesting perspective on advertising and content marketing from marketing professionals around the US. From Is Content Marketing Better Than Advertising? One area where that has truly taken hold is content marketing. The idea alone is not new but the development of the discipline is. As a result, many marketers are recognizing the importance of content marketing as a whole. More valuable than advertising? Part of that equation comes from the fact that content marketing generates earned media opportunities which carry a lower cost and more targeting than traditional advertising. Notice there is no mention of free. If anyone uses the term free and social media in the same sentence they should be abducted a flogged by the Internet Marketing Secret Service (it exists for real you know). The trouble comes in actually doing it. Continue reading the article for some great tips on actually doing content marketing rather than simply trying a few things without much direction. It’s a difficult strategy and right now many businesses are trying content marketing, but only a few are really succeeding and bringing in incremental sales. We seem to be in a state of change in the marketing world. Content marketing seems to be at the leading edge of the change from push marketing to pull marketing or as the guys at HubSpot call it – Inbound Marketing. The goal of pull marketing is to invest heavily in becoming a recognizable brand, a leader in whatever industry you are in and taking advantage of that notoriety and selling things to a target group of consumers. The article that included the chart above indicated some great points about content marketing as a strategy. It takes some research up front to determine is content marketing can even be profitable for your business. Will spending money, and it might be more than you expect, to create content bring in the sales and leads necessary to justify the effort and to make a profit? It’s the single question business leaders ask about content marketing. From my experience B2B companies seem to have a better chance at succeeding with content marketing. The strategy seems to really increase leads and generate more traffic to a site. It’s at the beginning of the sale funnel, but eventually drives profit. B2C companies can do well also. It takes some good planning up front before getting started and a solid implementation of constant experimentation with post type while trying new forms of content and expanding on what works.